What is spiritual direction and why do Catholics do it? William A. “Bill” Barry, S.J., is a Jesuit priest, spiritual director, psychologist and author based in Massachusetts. He entered the Society of Jesus in 1950, studied philosophy in Germany from 1953 until 1956 and studied theology at Weston College from 1959 to 1963. Ordained a priest in 1962, Father Barry earned a Ph.D. in clinical psychology from the University of Michigan in 1968. Father Barry has taught psychology at Weston School of Theology in Cambridge, Mass., directed the Center for Religious Development, presided as rector of the Jesuit community at Boston College and served as a novice master and formation director for Jesuit seminarians. 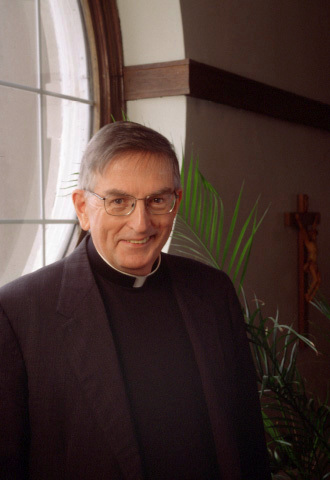 From 1991 to 1997, he served as provincial of the Jesuits in New England. Following that, he served as co-director of the Jesuit Tertianship Program. Father Barry currently directs retreats at Campion Center in Weston, Mass. An acknowledged Ignatian spiritual master, his 15 books include The Practice of Spiritual Direction, God and You, Finding God in All Things, Spiritual Direction and the Encounter with God, With an Everlasting Love and A Friendship Like No Other. His writings on Ignatian spirituality have appeared over the years in various publications, including America. I recently interviewed Father Barry by email about the Ignatian practice of spiritual direction. I guess the best answer is the one Bill Connolly and I described in The Practice of Spiritual Direction: “We define Christian spiritual direction, then, as help given by one believer to another that enables the latter to pay attention to God’s personal communication to him or her, to respond to this personally communicating God, to grow in intimacy with this God, and to live out the consequences of the relationship. The focus of this type of spiritual direction is on experience, not ideas, and specifically on the religious dimension of experience, in other words, that dimension of any experience that evokes the presence of the mysterious Other whom we call God. Moreover, this experience is viewed, not as an isolated event, but as an expression of the ongoing personal relationship God has established with each one of us.” It’s help with one’s relationship with God, a relationship initiated by God when he creates us. And people seek it out because they want help to develop that relationship. By the way, both Catholics and Protestants and what we might call seekers are intrigued with the idea of talking with someone who promises to listen and to try to help them with their relationship with God. How do you describe your own method of doing spiritual direction? The book mentioned in the last question gives a very long answer to this question. Short answer: I explain to those who come for spiritual direction that I want to help them with their relationship with God and that, as a result, I ask them to pay attention to those times when they are in contact with God or trying to be in contact with God and to tell me what happens in those times. I don’t want to focus on problems, but on their experience of wanting to be in contact with God or being in contact with God. I also focus on their desires in relation to God. Once they get the hang of paying attention to their experience and talking about it, I then help them to discern (figure out) what is of God in their experience, and what is not of God. I tend to see people once a month. As a Jesuit, what is distinctively “Ignatian” about your approach to spiritual direction? I suppose that the focus on the relationship with God and on the experience of that relationship is particularly Ignatian, but it may not be exclusively Ignatian. In the Spiritual Exercises Ignatius presumes that God is interested in a relationship with us and can be encountered. And he seems to want the director to pay attention to the experience of the one making the Exercises and to help the person discern. Moreover, he presumes that the relationship develops over time. How is spiritual direction different from pastoral counseling or psychotherapy? I was trained as a clinical psychologist, but over time have given myself solely to spiritual direction and the Spiritual Exercises. I see the difference as having to do with the focus of the sessions. Counseling and psychotherapy focus on the difficulties people have in their personal and professional lives as a result of behavior patterns that have developed over time but which are not helpful now. Spiritual direction focuses on what happens when a person attends to the relationship with God. Both types of help (at least with those forms of counseling and psychotherapy called talking therapies) rely on the desire of the person coming to the session for some help. Something in the “client” wants life to change. I tend to think that it may be the Holy Spirit who is the source of this desire in both cases, whether the person knows it or not. What inspired you to become a spiritual director? I had, from my early years as a Jesuit, had an interest in Ignatian spirituality. My interest in psychology had something to do with that other interest, I believe. But after I finished my studies and came back to teach and do counseling at Weston School of Theology in Cambridge, I hadn’t much of a clue of how the two would come together. In my second year at Weston, in the fall of 1970, our province started a series of weekend workshops led by Dominic Marucca, S.J., on giving the Spiritual Exercises to individuals. At the first weekend the penny dropped when I realized that I could use the skills of listening and conversation I had learned at the University of Michigan to help people talk about the experience of God. I was ecstatic. At that same weekend five other Jesuits and I began discussing a center for Ignatian spirituality which developed into the Center for Religious Development which the Provincial approved and which opened in the fall of 1971. The purpose of this center was to give spiritual direction, train spiritual directors and do research and writing on spiritual direction. In conjunction with Weston School of Theology we offered a school-year-long practicum for people with some experience as spiritual directors. It was a very labor intensive program in which up to 12 “associates” each year gave spiritual direction to as many as 10 directees a week under our supervision. The program lasted two semesters. I have never looked back. I find the work of spiritual direction challenging and invigorating and a great joy. I don’t seem ever to get tired of it. And why not? God is never boring. What are some of the graces you’ve experienced in your ministry as a spiritual director? I’ve already alluded to graces received in the prior answer. It’s a great grace to be able to engage in conversations about the experience of God. God is so surprising, so creative and so desirous of our friendship. As I’ve continued in this work over many years, I find that my main task is to rely on God’s love and desire for a deeper relationship. I don’t have to solve problems and come up with solutions to difficulties; all I have to do is to keep pointing those who see me back to the relationship with God. I have come to realize that God has promised us only that he will be with us; God does not promise success, health, a long life; but he has promised that he will be with us through everything life throws at us. Such fidelity over centuries brings tears to my eyes. I have also learned through experience to trust the wisdom of Ignatius in the Spiritual Exercises, especially in his rules for the discernment of spirits. What a gift he gave the church in that book! I have also been privileged to share great joys and great sorrows with many people as they move closer and closer to God. And I also have the grace to be able to continue this work even into my eighties, and for as long as my faculties continue to function helpfully for others. I feel as though my work is prayer, and that is a great grace indeed. Finally, since God is God, I am constantly surprised by joy. The biggest challenges came in the beginning, I think. It’s hard to learn to listen to others with an open mind. I made all the mistakes of any beginner, allowing my concerns to get in the way of listening. For instance, the first time I directed some people in an eight day retreat, I had ideas for each day as to what texts might be helpful, what themes might come up, etc. Of course, these got in the way of my listening to what the retreatant was looking for from God. But once the penny dropped, and I listened to the others without too many worries about what I would say next, I found myself relaxing and trusting God’s Spirit and my own prior preparation, and it was wonderful to hear what the others said. However, when people suffer intractable problems or persistent dryness in prayer, then I have to remind myself, or be reminded in supervision, of my need to trust in God and to keep to my belief about what my role is as a spiritual director. Another challenge is to care for everyone who comes for spiritual direction. All of us have our likes and dislikes, but if I cannot come to some liking of a person, I will not be able to be of real help to him or her. So I pray for God’s help to love others as God loves them. I have been surprised how often such prayer works. What’s your advice to someone who wants to try spiritual direction for the first time? I would first find out why they are thinking of trying spiritual direction to get some idea of their motivation. If I sensed that the reason had to do with a desire to develop a deeper relationship with God, then I would give them the names of some possible directors. I would tell them that they should try it out with someone for a few sessions and then ask themselves how they feel and whether they are getting some help with their relationship with God. “It’s not a marriage,” I would say, “Stay with it only if it’s helpful to you.” I also have said in talks on spiritual direction: “If you find a spiritual director who wants to help you, run away; if you find someone who is interested in your experience of God, you are probably in good hands.” In other words, I think that people who are really interested in God will better listen to another’s experience and thus be better spiritual directors. What are the typical setting and format for spiritual direction today? The typical setting is some kind of office space or room that is private, but also public, at least in the sense that others could see in. The latter caveat has been introduced since the abuse crisis. The format is informal. Some directors use a candle or some other symbol; some begin each session with a prayer. After the usual greetings that make people feel at home, I usually ask how things are going. Since I have set the focus as the relationship with God, this is usually where we start, namely with what has been happening in that relationship since the last time we met. We converse about the experiences of the directee. I ask questions that facilitate a reflection on these experiences and on what is of God in them. As the session winds down, we talk about the next steps the person will take in the relationship with God. I usually have an hour for each appointment, but most of them don’t last an hour. When the directee is satisfied that he or she knows where to go next, we finish. What’s the purpose or goal of spiritual direction? I think I answered this question when I answered the first one. I believe that purpose is to help another to develop a deeper relationship with God. Since that relationship can keep growing deeper to the end of life, I don’t see any reason not to keep seeing a spiritual director until then. All of us can get untracked in the relationship with God at any stage of life. How does one’s image of God play a role in spiritual direction? Every image of God we have is an idol, but some are more true to who God is than others. In fact, I think that God is constantly showing us the inadequacy of our images as we deepen our friendship with God. I guess that something similar happens in any close friendship; there is always something new to learn about anyone since we are mysteries to ourselves as well as to others. But God is really Mystery itself. So relating to God means constantly giving up our mistaken notions and images of who God is. So, in answer to your question, one’s image of God plays a very central role in spiritual direction. Perhaps when we do see God face to face (whatever that means), I have often said, we will finally know for sure that God is Mystery itself, but then we will be overjoyed that this is so, because then we will know that God is God, not just a bigger being than we. Do you have any final thoughts or words of wisdom? I am grateful to have been asked these questions. God gave the people of God a great gift in inspiring Ignatius to write the Spiritual Exercises. In this book he developed from his own experience a way of showing others how to help people with their relationship with God. I have come to believe that God has always wanted us human beings as companions and friends and as helpers in the great work of creation, which is to bring about what Jesus called the Kingdom of God. Spiritual direction in this tradition is, therefore, one of the great ministries bequeathed by Ignatius to the church. Thanks for this post. I've read almost all of Fr. Barry's books, including 'The Practice of Spiritual Direction'. Of all the books I've read about theology or spirituality, his books have been the most helpful to me in trying to see if God does exist and can be interacted with. I also really appreciated the chapter he wrote in 'Paying Attention to God: Discernment in Prayer' about women being priests. Thank you everyone for reading. Let's continue to pray that God draw all people closer to himself in relationship.